It came as a challenge: find a quiet place to get alone with God, one without sound or light. * The first place the speaker suggested was a dark basement room; the second place was an empty closet. Well, dark basement rooms are usually cold and damp; mine gives me the chills. I try not to spend much time down there. As far as an empty closet is concerned (I’m laughing here), mine are so full of “stuff” that they can’t hold a human. I did find a solution, though, and what happened afterward changed me. Years ago I had read of a famous evangelist’s mom who had taught her children to not disturb her when her apron was over her head; she was praying. Without a basement or empty closet, she’d found a way to meet with God. So could I. In opening my heart and thinking to what could be done, I found a way. First, seclusion—with an empty house that day, I appropriated the bedroom. Second, quiet—I stuck earplugs into my ears. Third, dark—I put a towel over my head and closed my eyes. (I’ve since switched to tying a scarf around my eyes like a blindfold). Due to a tricky knee I can’t kneel, so I sat on my computer chair and prayed. Now this wasn’t a prayer of asking; this was a prayer of letting go and inviting God to come. Then I waited. I thought on God and on Jesus, His Son. Praises to Them rose up and I spoke them out loud. I waited some more. Sometime after that, thoughts of a struggle I was going through came to my mind and I silently shared them. In my mind’s eye I saw Jesus standing in front of me. I stood there too and my heart poured out everything. I don’t remember using words—no need for words. He knew. I bowed my head, leaned it on His chest, and cried. He put His arms about me. When done, my heart was emptied of all turmoil and concern. I was filled with peace—His peace. 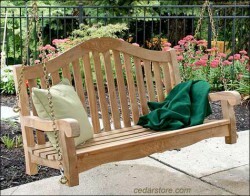 He led me to a porch swing, and we sat side-by-side in silent companionship. I don’t know how long Jesus—my Lord—and I sat there. What I do know is that He wanted to meet with me again, and has. He wants to meet with you too. Jesus met with His “Dad”—God the Father—every morning while He was here on earth. Although He is God the Son and all-powerful, quiet-time with God the Father enriches, refreshes, and supplies a peace and love no other relationship on earth can. Do you know how I absolutely, from-my-core KNEW that? Yes, because of the day I met Jesus and sat on the porch swing with Him—and because of the days when He faithfully has met with me after that. God is faithful. God is love. He is waiting for you to draw close to Him so He can draw close to you. I pass the challenge on to you. *The challenge came from Dr. Charles Stanley, In Touch Ministries, in his message “God’s Stress Remover”. This entry was tagged empty closet, God, God the Father, Jesus, peace, porch swing, prayer. Bookmark the permalink.